Microvia is the smallest colony of the Empire. With a total area of just under 65 square feet (roughly 6.0386978 square meters), it was annexed due to a recently discovered anomaly in English sovereignty laws. Microvia lies on the border of two English Counties in beautiful rolling countryside. Our Motto, 'Multum in Microvia' translates roughly as "There's lots of good stuff in here." The area has a long history, and is mentioned in the Doomsday Book. Local archaeology includes Neolithic arrow-heads, Roman pottery, Civil War musket balls and bits of a bomber which made a forced landing on a local reservoir from which the crew were rescued by rowing boat. According to Mr Tom Scott's "Mystical Ley Line Locator", Microvia sits at the junction of three major Ley lines, one from Netherhall to Otford in Kent, another from Icklingham to Alconbury Weston and the third, perhaps the most significant, runs from Uffington to -- wait for it -- Stonehenge. Clearly this is a place of surprise and mystery. Rumours persist that Microvia is also the home of the AIIS, the very secretive Aerican Imperial Intelligence Service, charged by His Majesty with protecting our beloved Empire from invasion by unfriendly Aliens. Friendly ones are OK.
Microvia is ruled by its benevolent governor, Major General Green Jumper. The Major General may or may not serve double duty as the Director General AIIS, depending on who you ask and how many people are listening in. The light green represents the surrounding Northern County, the dark green the Southern County. 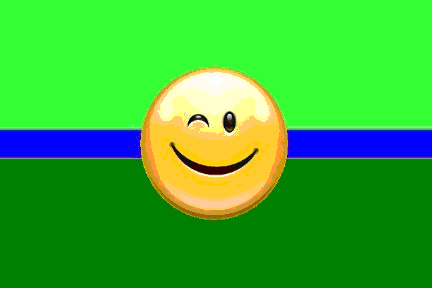 The blue line represents the territory of Microvia itself, surmounted by the winking version of the Imperial Smiley, the badge of the Aerican Imperial Intelligence Service, which is (supposedly) based at Microvia.